Frank Lloyd Wright was an American architect. He was a leader of the Prairie School movement of architecture which was most common in the Midwestern United States. He designed more than 1,000 structures of which over 500 were built. A couple of his most famous buildings include Fallingwater, a house built in Pennsylvania in 1935, and The Guggenheim, an art museum located in Manhattan's Upper East Side. One of Frank Lloyd Wright's most famous kin would have to be his granddaughter, Oscar winning movie actress Anne Baxter. He is also a direct descendant of England's King Edward I with kinship to King Henry VIII and at least two of his wives, Anne Boleyn Jane Seymour. He also has kinship to the current royal family through Princess Diana and her son Prince William. 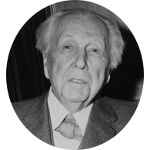 Frank Lloyd Wright has a number of U.S. presidential connections including, but not limited to, George Washington, Franklin Pierce, William H. Harrison, Thomas Jefferson, and James Madison. Some of his closest connections to current celebrities include Alec Baldwin and Kyra Sedgwick. Dr. Ebenezer Gray is the 3rd great-grandfather of Frank Lloyd Wright. He is one of the original 46 founders of the Redwood Library and Athenaeum in Newport, Rhode Island. It is the oldest lending library and the oldest library building in continuous use in the United States. Mrs. Alice Prentice is the 6th great-grandmother of Frank Lloyd Wright. She was the wife of Valentine Prentice, 6th great-grandfather of Frank Lloyd Wright, and later John Watson. The marriage record for Valentine and Alice shows that her maiden name began with the letter B, however the rest of her name is illegible. More research is needed to try and identify the maiden name of Alice and who her parents might be. Sarah Sedgwick is the 6th great-grandmother of Frank Lloyd Wright. Sarah is often cited in sources as the daughter of General Robert Sedgwick who arrived in New England by 1636. However, the family bible of her husband John Leverett is said to have contained an entry that stated "9th September 1647 marryed Sarah, daughter to Mrs. Elizabeth Sedgwick the widdoe of William Sedgwicke, maryed at Louisham in Kent at the home of her brother Mr Robert Houghton." Her actual father William Sedgwick was the brother of General Robert Sedgwick. See Leverett Saltonstall's Ancestry and Descendants of Sir Richard Saltonstall, (1897), pp. 150-152. William Hubbard, Jr., is the 6th great-grandfather of Frank Lloyd Wright. He was an historian and the author of A General History of New England from the Discovery to MDCLXXX. His father was William Hubbard, Sr., who came to New England aboard the ship Defence in 1635. Many sources claim that the mother of William Hubbard, Jr., is Judith Knapp, the only known wife of William Hubbard, Sr. Through Judith, descendants can claim royal ancestry. However Robert Charles Anderson, in his The Great Migration series of books, points out that based on the ages of the children given in a 1635 passenger list of the ship Defence, William Hubbard, Sr., must have had two wives because Judith was not old enough to be the mother of his four oldest children, including William Hubbard, Jr. Also a gap of seven years between sons William and Nathaniel support a second wife. Based on Anderson's conclusions, only Nathaniel, Richard and Margaret Hubbard are the children of Judith Knapp. All the other children of William Hubbard, Sr., are from an unknown wife.